One can find thousands of vintage war time print ads which people have scanned so we can poke fun at them later. A popular format was the multi-panel story, in this case in straight-up comic book style. Until late in World War Two, flight schools in the U.S. were chronically short of the need for combat pilots, which had to be men. Women filled the ranks doing everything short of front line missions, including patently dangerous jobs like initial flight testing or long-range ferry service over the vast Pacific. 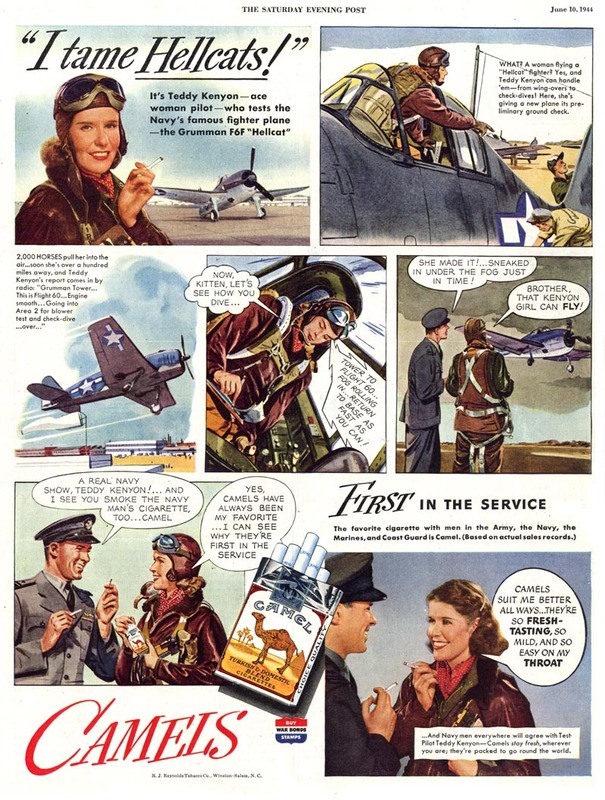 On this page for Camel, Ms. Teddy Kenyon (no rank given), puts a Navy fighter through its paces. But the repeated message is that Camel is the men’s favorite. It just happens to also be easy on the lady’s throat. This entry was posted in history, humor and tagged 1940s, advertising, home front, home front america, The American Home Front, world war two, ww2, wwii. Bookmark the permalink.